I've never been a fan of Weird Al Yankovic, but I used to be a fan of his more vulgar ripoff, Rucka Rucka Ali. After watching this episode, I actually saw some Weird Al videos and I can't believe I've been missing out all these years. Since he was a kid, Adam has been a fan of Weird Al, so when Dana comes over to meet her grandma, Adam decides to surprise her with concert tickets. However, when Dana shows up, things take a dull turn. Before Adam takes her out, he tries to spend time with Dana by indulging in all their favourite activities like pogo ball and Super Mario, but Dana doesn't seem interested. Dana eventually gets tired of Adam's childishness and gets angry at the concert, arguing in front of Weird Al. Weird Al tells Adam that they were apart for to long and this makes Adam feel bad. Seeing Adam sad about Dana, our beloved smother Beverly goes to Weird Al to fix Adam but he tells her that only she can fix him. She tries to bring them together by showing a slideshow about them but at this point, it seemed that they had accepted that their relationship was over, but this didn't stop Dana from trying to end things in a good way. Dana pulls the old Juke box at the window and plays "King of Suede" by Weird Al.She tells him goodbye and that she will always remember him, making Adam realise that this was all part of growing up. Meanwhile, Barry signs up to be a peer counsellor and knowing the trail of destruction he will leave, the guidance counsellor, Mr. Glascott makes Erica a counsellor as well. This leads them to a counsel- off( not a real word) to see who can cure their dad's depression first. However, when they see that his depression could be a real problem, they abandon the competition and make Murray talk to Mr. Glascott. However, it is discovered that Murray doesn't have depression but is merely living the way he wants. In the end, Erica and Barry decide to help Adam after his breakup by going bike riding together. 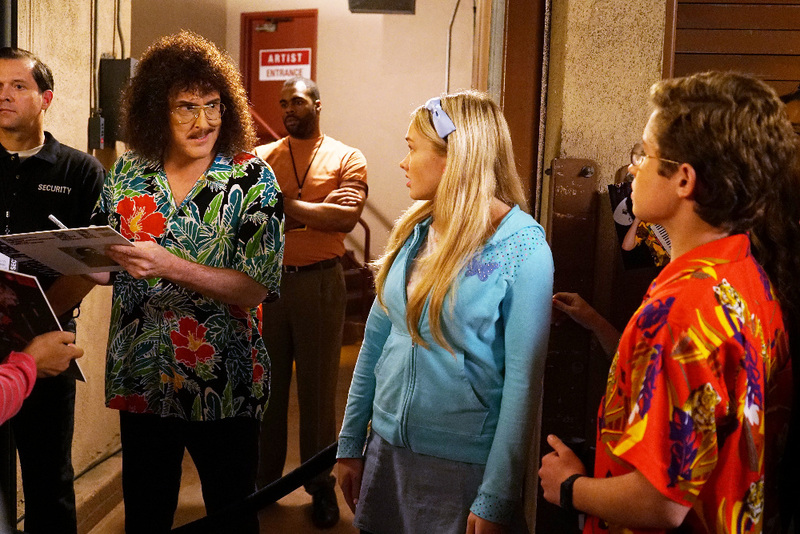 It's been a long time since the Goldbergs had such an emotional episode. Seeing Adam and Dana ending things was something I felt was necessary since we all know long distance relationships don't work. But just knowing doesn't make this easier. This event may be what Adam needs to grow emotionally. I'm glad that the story(or what little exists) is moving forward. My favourite parts of this episode were when Barry and Erica tried to cheer Murray up and when Dana says goodbye to Adam. I hope we see her again someday. Quote of the week: " Look at how they're playing Super Immigrant Plumbers, their thumbs are in it, but their hearts aren't."